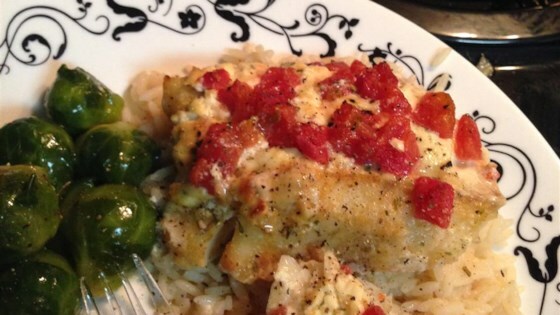 "Use Boursin or Allouette Cheese and canned tomatoes seasoned with onion, peppers and garlic to make this dish with fresh cod. It's an outstanding fish recipe for a quick and easy-to-prepare dinner. Add a tossed salad, a green vegetable side dish, and your dinner is complete. Olive oil may be substituted for the butter." I give it a one because it was edible. Soggy fish. Just bake your fish without the soggy stuff. I loved this recipe- only changes I made were to use some happy cow cheese (garlic and herb flavor) and a can of fire roasted tomatoes. My husband loved it, will be a repeat dinner! MY WIFE LOVED IT THE ONLY CHANGE I MADE WAS I DICED A FRESH TOMATO AND ONION AND ADDED SOME FRESH BASIL. MY WIFE DOES NOT LIKE GARLIC. THANK YOU FOR A GREAT DINNER!!!! I think this is one of the best meals I have ever made. I used light boursin and a tomato basil bruschetta topping. Tasted like I slaved over it all day!